/ About Us / Our Team / Physicians / Timothy D. Moore, M.D. A graduate of the University of Pittsburgh School of Medicine, Dr. Moore served his internship at the University of Cincinnati School of Medicine, and his residency at Mercy Hospital in Pittsburgh, finishing as Chief Resident. He completed his fellowship at The Ohio State University School of Medicine, Division of Hematology/Oncology. Dr. Moore served as Senior Investigator, Clinical Investigations Branch, then as Senior Investigator, Developmental Chemotherapy Section, Investigational Drug Branch, both in the Cancer Therapy Evaluation Program at the National Cancer Institute. From 1992 to 1994, Dr. Moore was attending physician at NCI-Navy Medical Oncology Services at Bethesda National Naval Hospital and Project Officer for the Investigational Chemotherapy Combination Contract at the Southern Research Institute at the University of Maryland. 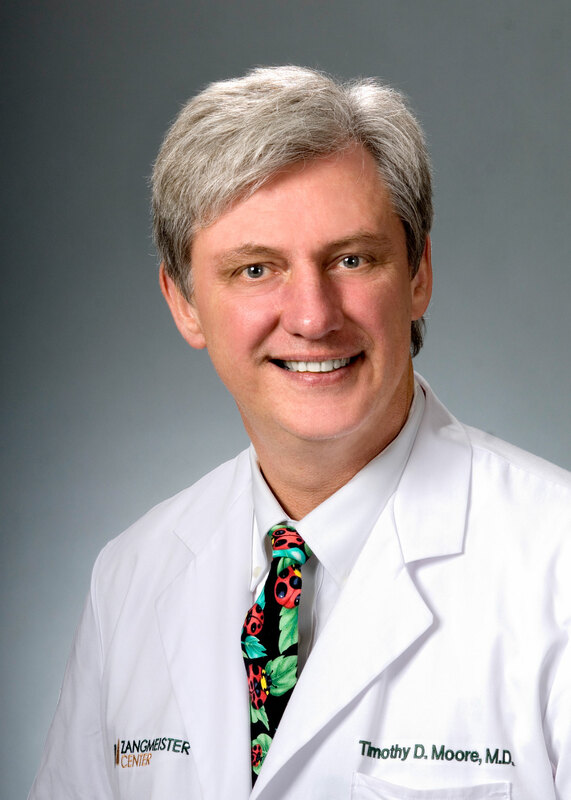 Dr. Moore treats all cancer and blood disorders, and has a special interest in melanoma and clinical trial research. He serves as Co-Medical Director for Palliative Care at The Zangmeister Center. He is board certified by the American Board of Internal Medicine in General Internal Medicine, Hematology, Medical Oncology, and Hospice & Palliative Care Medicine. Dr. Moore is a member of the American College of Physicians, American Society of Clinical Oncology, American Society of Hematology, Community Oncology Alliance, Columbus Medical Association, the Ohio State Medical Association and the Ohio Hematology Oncology Society, and is the Principal Investigator of the Columbus NCI Community Oncology Research Program.